Hi, I am interested in your 1960 Jaguar Mark II (stock #4795-CHA) listed on Autotrader for $25,995. I'd like to get more information about this vehicle and confirm its availability. 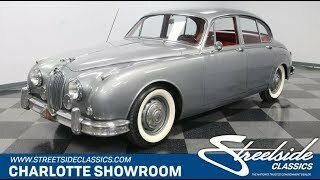 This 1960 Jaguar Mark II is one of the great iconic European sedans. After all, it blends old-world craftsmanship with features built for pure driving pleasure. And you get it all for quite an obtainable price. Theres no mistaking this for anything else but a Jaguar. The design of this sedan (ok, saloon for the purists) is so iconic that Jaguar even used it for its retro-style S-Type three decades later. You can instantly understand why this is a legendary machine. The design does amazing work with sheetmetal. While Detroit was producing square-like cars with tailfins, this was going in the exact opposite. Theres a beautiful style line that starts above the front bumper, curves up the fender, runs through the doors, and doesnt stop until it reaches the rear bumper. That is true grace and elegance. You see that everywhere in the design from the curved rear glass, to where the bumper dips to show off the XK-inspired grille. And because this car is so complete, you have great classic styling details, like whitewall tires, partially skirted rear wheel arches, and the iconic Jaguar leaper leading the way. That little disc brake badge in the middle of the rear bumper is there to remind everyone that there was state-of-the-art technology hiding within these elegant lines. The silver exterior is a fine traditional British color, but what really sets this car apart is the leather interior. It appears like someone made an investment in this one later in life, because the red is quite vibrant. So even from the outside it almost looks like its radiating from within. A proper Jaguar sedan has the right balance of sporting and comfort. Thats why you have bucket seats up front that are exceptionally plush. The rear has good space, and even a fold-down armrest for individual comfort. With plenty of real wood on the doors and dash, the atmosphere will instantly remind you why classic Jaguars are cherished. And the heater toggle switches, starter button, and thin/grippy steering wheel is a nice reminder of this cars sporting heritage. Jaguars inline-six is the true star of this car. The dual overhead camshaft motor has been part of a legacy thats powerful enough to win a Le Mans and smooth enough to be a staple of the XJ-series into the 1990s. This is an upgraded unit 4.2-liters being larger than anything originally offered in the Mark II. It has that great classic Jag look with the polished alloy head stretching through the engine bay and twin SU carbs mounted on the side. This motor fires up nicely and makes that unmistakable Jaguar tune. This was built as an automatic transmission car, and the correct Borg Warner three speed is still in place and shifting smoothly. So it has a fine cruising nature. Plus, the four-wheel disc brakes give this sedan a true handling and stopping advantage over the rest of the 60s-classics out there. A classic Jag sedan is rolling beauty with a sporting nature. So if you love well-priced elegance, dont let this one slip away. Call now!